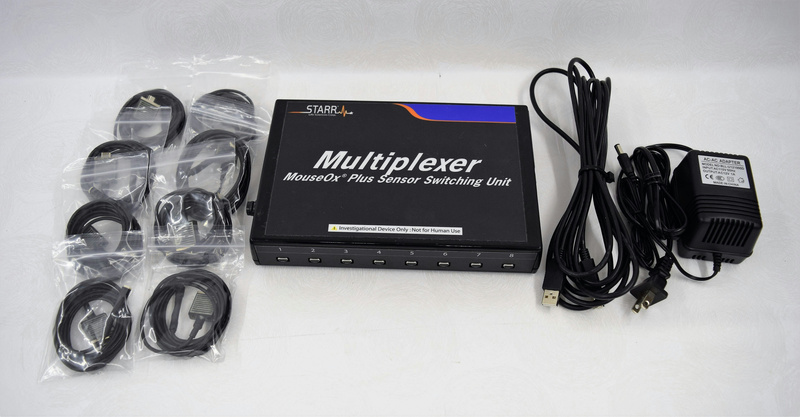 Starr Life Sciences Multiplexer 8 MouseOx Plus Sensor Switching Unit . New Life Scientific, Inc. The Multiplexer 8 extends the function of the MouseOx Plus by allowing monitoring and recording of data of up to 8 subjects connected to a single MouseOX. The Multiplexer is an accessory that allow you to monitor multiple subjects, one at a time, using one MouseOx Plus control unit. The Multiplexer allows you to choose between automatic or manual switching. The summary screen shows all subjects being monitored by the Multiplexer as well as all physiological parameter reported by the MouseOx Plus. Starr Life Sciences product page. This instrument is in excellent cosmetic condition and all accessories appear to be in functional condition. There are no signs of damage or extensive wear to the ports. New Life Scientific technicians have evaluated the instrument for damages, noting none. NLS does not have any animals to test the system. This product was confirmed functional and will include the components photographed. If the customer is interested in purchasing a PC workstation separately, please inquire within. To monitor and record data on mice/rats.